Great coffeemaker, purchased because our Braun purchased from name brand store which we paid as much for, died after 1 year, after warranty expired of course. Saw this, price was very reasonable and haven't looked back since. Makes excellent coffee, easy to fill and clean. Enjoy the rich aroma and velvety texture of a professionally brewed coffee with KitchenAid's One Touch Coffee Maker. This coffee is designed with a contemporary white and stainless steel design and contemporary digital displays that are easy to read. Each feature is simple and intuitive for a hassle-free brewing process. 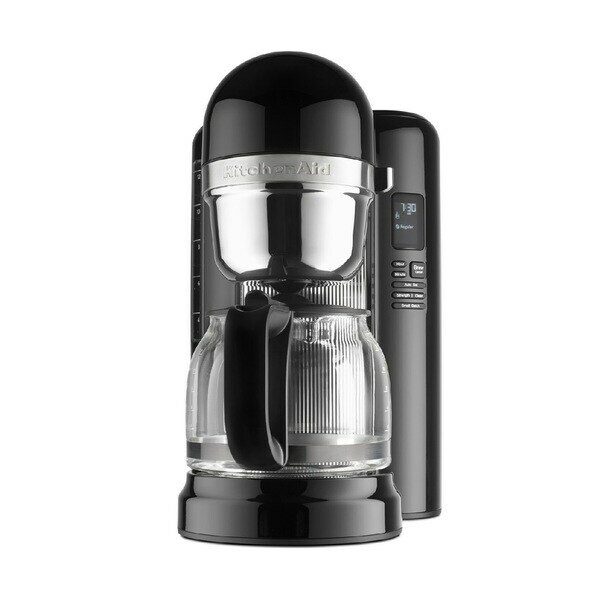 This White & Stainless Coffee Maker includes a glass carafe with a 12 cup capacity, but offers small batches for 2-4 cups. The temperature adjusts automatically to prevent burning and to maintain the coffee's smooth textures. The 24 hour timer ensures that your coffee will be ready at a precise time, day or night. KitchenAid's 12 Cup Coffee Maker & One Touch System is ideal for waking up to a freshly brewed pot of coffee and will still be there to accompany your dessert. What else can I say. Looks good and makes a great cup of coffee. Gonna get a lot of use during this cold winter. This will be my third KitchenAid coffee maker as I tend to wear them out very quickly (love my coffee). This is a great coffee maker. It’s easy to program and use. It allows for smaller amounts to be brewed and I can adjust the strength. It’s largef than I thought and just doesn’t quite fit under my cabinets. But it was definitely another great purchase. Very stylish and clean looking. Brews a great pot of coffee! I am very pleased with this coffee maker, easy to use and makes delicious coffee. My recent company commented on the great tasting coffee I serve and I highly recommended this coffee machine. It also is slim and fits nicely on the kitchen counter beside the fridge. Best coffee maker!! The copper mesh filter is so convenient, never buy coffee filters again. All the classic quality you’d expect from KitchenAid. It’s great! It works as good as it looks. We are very happy with our new coffee maker. It’s a Christmas gift and hasn’t been opened yet! "Does this coffee maker shut off automatically after a certain amount of time?" "How tall is this coffee maker?"